A few pumpkin plants came from our compost last spring and grew into a very healthy plant that gave us handful of pumpkins. Though the yield is not large but the fruits are very sweet and tasty. 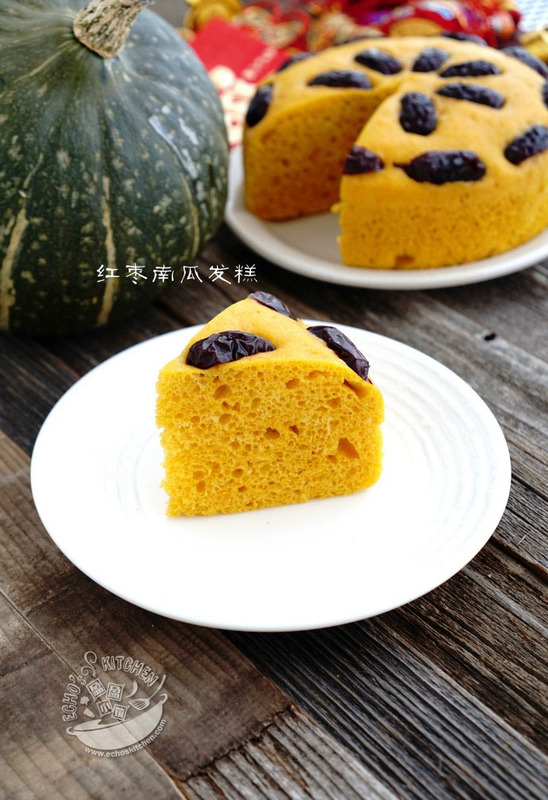 I made a couple of dishes with my homegrown pumpkin and this Steamed Cake is one of that. 1. 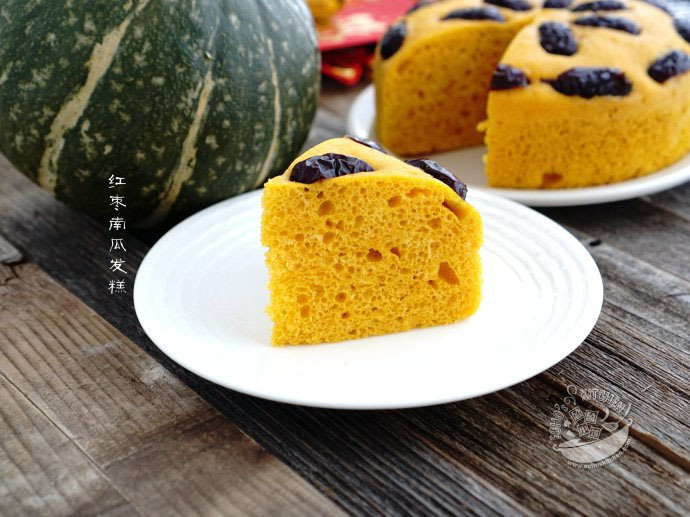 Peel and cubed pumpkin and steamed it for 30 minutes, weigh 250 g of steamed pumpkin out, if your pumpkin's color is not very bright, you can also add a small piece of steamed carrots. 2. 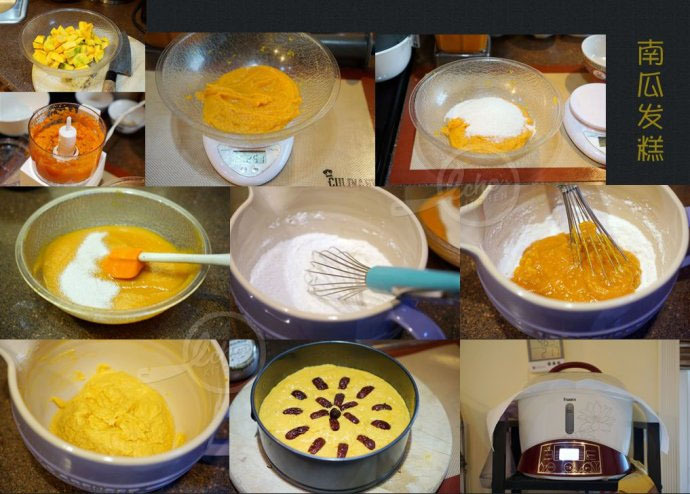 Blend or mash the pumpkin into a paste, add the sugar and mix well. When the pumpkin paste becomes slightly higher temperature than room temperature, add 1 tsp of yeast and mix well. 3. Add the paste to flour with 1 tsp of oil and stir the paste and flour together to form a sticky dough, when the stir of dough become harder, the consistency of dough is right. 4. Brush a 6 inches round baking pan with some oil and place the dough in the pan, rub the surface with a little water to smoother it. 5. Soak dates in warm water, remove seeds and cut the dates into half. 6. Place the dough in warm place and rest for 20-30 mins, when the dough has rises to about almost doubling its size, decorate the dates on the surface and slightly pressing the dates. 7. Steam the cake at about 350F (175C) at high for 25-30 mins. Once the steaming is done, wait for 5 minutes before opening the lid. 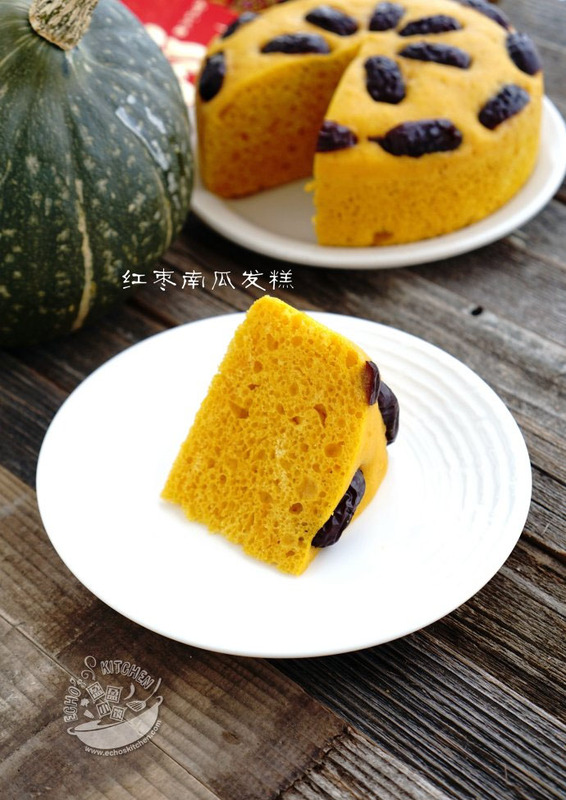 Wait the cake to cold down before removing from pan and slice to serve.